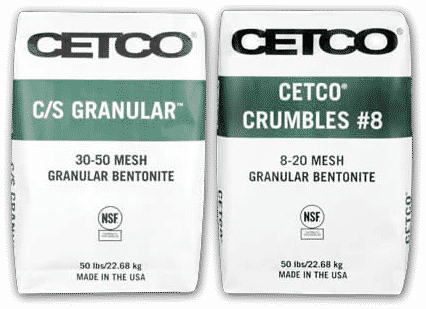 C/S Granular™ and Cetco® Crumbles are granular bentonite products composed of polymer-free, dried bentonite clay in various mesh sizes. Cetco® Crumbles are coarser in size than C/S Granular™. Both products are certified to NSF/ANSI Standard 60, Drinking Water Treatment Chemicals – Health Effects. Cetco® Crumbles may also be used with Accu-Vis™ to make a high solids grout.